Today is such a Terrific Tuesday!! I want to give a BIG WOO-HOO WELCOME to justme at mandatory blog here. I found her when I was "doing the drop" with Entrecard, and her blog is so interesting!! You have to read her post about the Gamma Gene. It is short but funny! :) Drop on by her blog when you have time today. You'll see what I mean!! "Now until June 29, you can enjoy a Grande (16 fl oz) Iced Coffee with Milk for just $1.95. 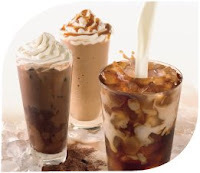 Or check out another one of our cold coffee favorites: Iced Coffee Mocha and Caramel Frappuccino® blended coffee. Find a coffeehouse in your neighborhood with these refreshing beverages. How cool is that? Now, if only we had one in my SMALL town...oh well...sigh....at least we have a grocery store! For those of you who are into rebates, check out this link that I found while on the forum.coupon mom. ** link: quilted northern. ** The CouponMom forum is incredible! Check it out!! Aww, thanks! I'm Desiree's friend and also a mother of twins! Feel free to check out my blog: http://niquelife.blogspot.com. Good morning!!! And a big thank you for the Starbucks info. I think even I can afford it!! I had $7.50 in RR expiring Sunday so I went and got the Skintimate (used $1 q), the Bayer (used $1 tearpad q found at CVS), 2 Royal Jello (.25 fillers)and the Right Guard (used $1) Paid the rest with the RR and .95 on giftcard, got back $8 in RR. I'm still sad the rebate program is gone though. SonyaAnn, Aren't Starbuck's Coffees just delish?? I don't know what it is...I can make Starbucks here at home, but it just doesn't taste the same! Jessica, Awesome job of "snagging the deals!" I really miss the rebate program. I loved having $$ on my gift card. The RRs are such a pain, because you only have a certain amount of time to use them, and half the time, my Walgreen's machine isnt' working. So, I have to send away for the RR, which sort of defeats the whole purpose!! Your blog is fun too! Sunday, the machine jammed up in the middle of the RRs printing so we had to redo the transaction. If they're going to just do RRs they should have a system like CVS where it prints on the receipt. I hate worrying if there is ink or paper or if it's not working or offline. I always hold my breath at Walgreens, but I can't give it up yet. I love Starbucks but my days of visiting Starbucks are now few and far between. DH bought me my own machine for the house:) But but with this 1.95 deal I might have to splurge this weekend. Jessica: That's what I'm talking about; their machines are just junk! You are so right about CVS; my sister, Danesa, loves CVS!